Passed away peacefully on Wednesday 20th March 2019 surrounded by family. Loved wife of Cono (dec). 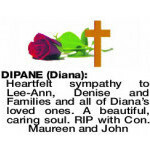 Cherished Mum of Lee-Ann and Denise, Mother-in-law of Eddy (dec) and Dino. Adored Nanna of Matthew, Lara and Shanae. Together with Dad in eternal peace. The Funeral Service details will be in The West Australian on Wednesday 27th March 2019. 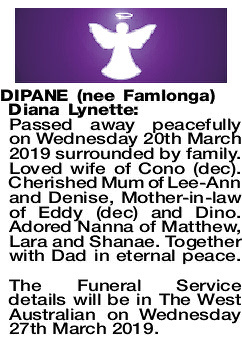 The Funeral Mass for Diana Dipane (nee Famlonga) of Atwell will be celebrated in Our Lady of Mt Carmel Catholic Church, 82 Collick Street Hilton commencing at 10.45am on TUESDAY (2.04.2019). The cortege will leave the church at the conclusion of Mass and arrive at the main entrance of FREMANTLE Cemetery, Carrington Street, Palmyra at 12.15pm for a Burial Service. At the conclusion of the Burial Service you are invited to join the family for light refreshments in the West Chapel from 1.00pm. Vigil Prayers and Rosary will be recited in Bowra & O'Dea Chapel, 312 South Street Hilton at 7.00pm on MONDAY (1.04.2019). 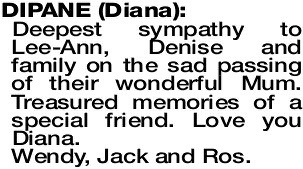 Those wishing to spend time with Diana may do so at a Viewing from 6.30pm prior to the Rosary. Special memories of Diana, now at peace with her Con. 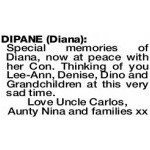 Thinking of you Lee-Ann, Denise, Dino and Grandchildren at this very sad time. 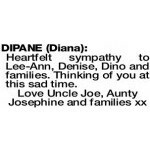 Heartfelt sympathy to Lee-Ann, Denise, Dino and families. Thinking of you at this sad time. 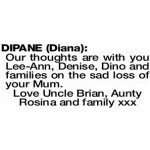 Our thoughts are with you Lee-Ann, Denise, Dino and families on the sad loss of your Mum. 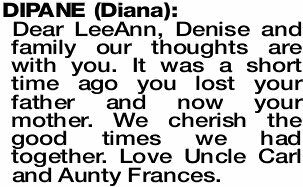 Our heartfelt sympathy to Lee-ann, Denise and family. With many fond memories of our fun times together. Love always, Con and Trudy. 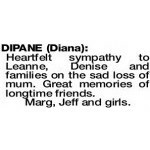 Dear LeeAnn, Denise and family our thoughts are with you. It was a short time ago you lost your father and now your mother. We cherish the good times we had together. Love Uncle Carl and Aunty Frances. Lovingly remembered by Eunice and Noel. 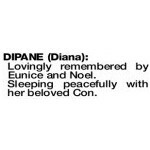 Sleeping peacefully with her beloved Con. 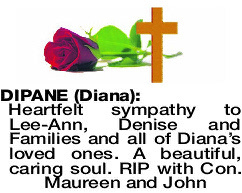 Heartfelt sympathy to Leanne, Denise and families on the sad loss of mum. Great memories of longtime friends. 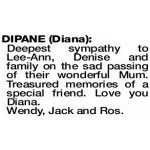 DIPANE DIANA Deepest sympathy to Lee-Ann, Denise and family on the sad passing of their wonderful Mum. Treasured memories of a special friend. 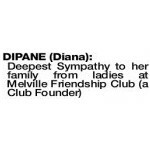 Love you Diana.